The first phone that was not dependent on a cable was made in 1938. This is not taken into production by the war. After the war, the project “Mobile phone” (OLN) National Public Net, picked up again. The first was delivered in 1948. Until a little after 1980, several manufacturers have created different devices. My oldest device is a Van der Heem made in 1952. 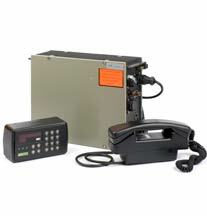 In 1980, became the first Auto Telephone network (ATF) operational. Of this type are only two different models sold in the Netherlands. The Castor and Pollux. 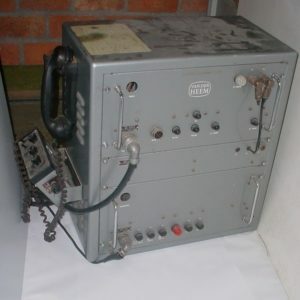 These devices yielded such poor quality that, probably after the second car telephone system (ATF2) became operational all these devices are quickly replaced. There are to my knowledge, only one copy each preserved at the “Muscom”. This is the National Museum for Communication. 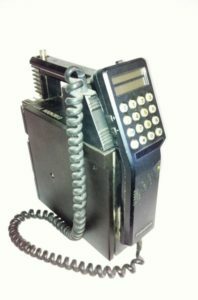 In 1983 the second car telephone (ATF2) (also called NMT2) became operational. The Carvox series was introduced by PTT. The first was the Carvox 2451. From this model, I have only the handset. I have the successor Carvox 2452. 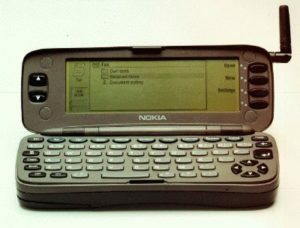 After a little while produced Nokia the first portable device and sold by PTT the Carvox 2453. Manufacturer Nokia sold this under the name mobira. This model is in my collection. 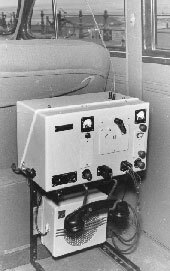 In 1989, the third car telephone (ATF3) (also called NMT2) became operational. The higher frequency is capeble to have more channels. The mesh size is smaller. The advantage was that the devices could be smaller but more transmitters are needed. The first handheld came on the device market. The advertisement indicated that this was the first device that you could carry in your pocket. However, this is a very optimistic description. In 1993, the GSM network operational. 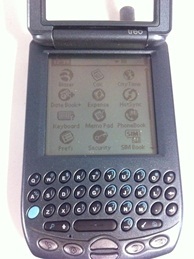 The official first device, the Pocket Line 8000. 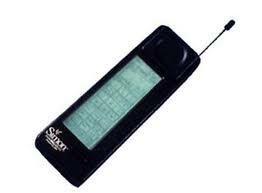 In America in 1992 was the first Smartphone produced is the IBM Simon. This was never sold in the Netherlands. 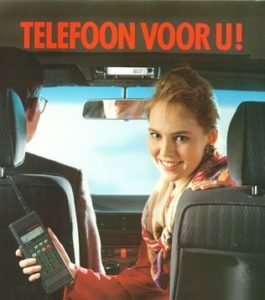 The first Smartphone in the Netherlands sold is the Nokia Communicator 9000 in 1996. This device has the operation system (OS) Symbian. 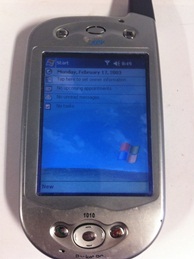 The first device with the OS Palm in the Netherlands was the Handspring Treo. There are two different types, with a keyboard and with an on screen keyboard. I have both models. 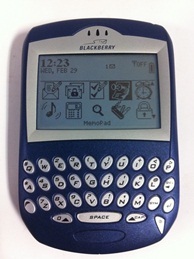 The first Blackberry in the Netherlands was the Blackberry 6220. I also have this one in my collection. 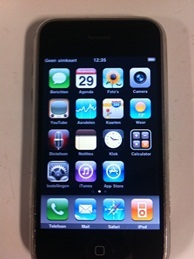 The first iPhone is never been sold in the Netherlands. The first one officialy sold was the iPhone 3G. Before iPhone, Apple and Motorola has a partnership and sold the Motorola Rokr. 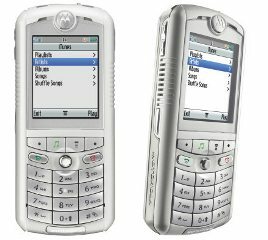 The Motorola Rokr could use iTunes for music. 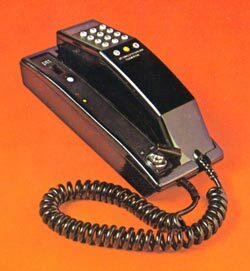 In 1982 Apple designed a telephone for the regular network with a touch screen. However its never being sold. 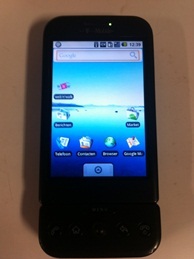 The first device that runs with Android and sold in Holland was the HTC G1. Android became a great succes becouse there is a lot of apps develept for all the factory’s that made Android phones.